Stand Up Gaming » How Hard?! I know I just did a joke on Fairy types, but it’s a gold mine. Besides, I can’t be the only one who’s disappointed that their power is now broken, but the internet doesn’t seem to have realized it yet. I actually thought Fairy-Types would be strong against Ghost-Types. I don’t know, the whole “Magic vs. Death” thing is probably in debate across fandoms (Harry Potter, magic cannot raise the dead, but in the Harry Potter video games magic can easily harm ghosts so I don’t know). 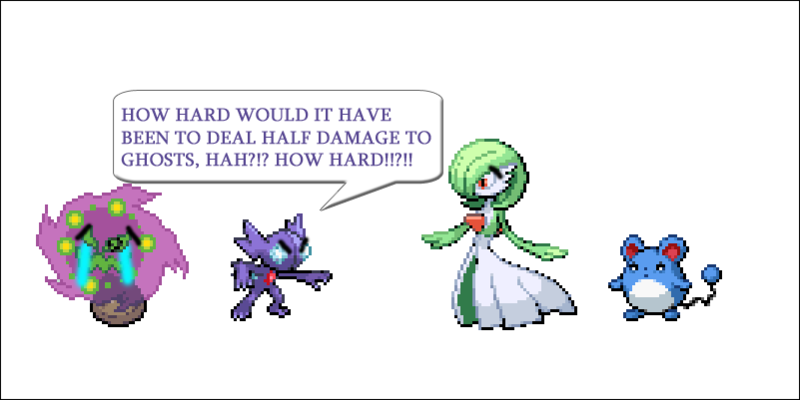 It easily could have gone either way, if ghost had resisted fairy no one would have been particularly surprised and Spiritomb and Sableye could have stood tall.